Your little one begins their path into art hugged in gentle loving guidance, and lots of colors and textures. Watch your wide-eyed and blossoming artist explore their curiosities and learn to create art from what's bubbling up around them. Together our littlest artists will assemble materials around well defined themes to bring their imagination to life! Enrolling mid session will prorate your tuition. 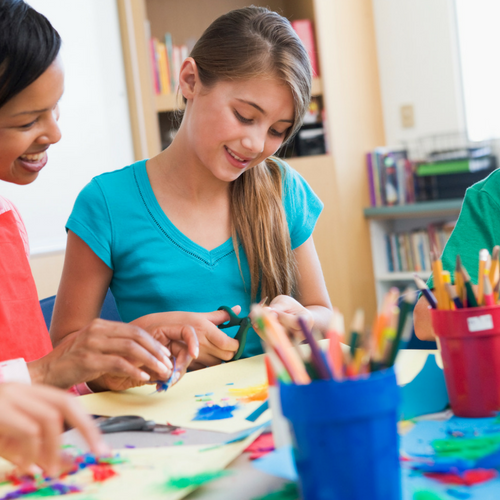 With gentle and inspiring instruction, your child will discover and explore the beginning elements of art. We’ll help them tap into their imagination and, with a variety of colorful and textured materials, they'll create their very own mini masterpieces! Your budding artist will begin to identify and celebrate their originality as they explore more artistic media and the everyday stuff that surrounds them. They will love that their artwork begins to reflect their ideas. And they will begin to create art reflecting things that they love to think about. Young artists will love diving deeper into their favorite media, honing their artistic skill and technique. As they think about and create their artwork, they'll deepen their understanding of artists' tools, the elements of art, and their interplay. Starting with an introspective look, art students begin to think of art as a way to consciously express who they are and what they're thinking about. Here the media and creativity begin to incorporate their own ideas and convictions. Their uniqueness produces art that is expressly theirs, and their skills with favorite media add increasing wow! to their creations. Explore the elements and principles of art with a fresh set of eyes. Tap into your personal narrative to create works that reflect where you've been and where you're going. With exposure to a broad range of media and art making techniques, this course will allow individuals the freedom to translate emotion into the visual while cultivating or continuing to build skill. Flexible instruction for those dabbling for the first time or an experienced artist!